Guys check out Priyas blog! Honest reviews of high end products to high street products! I have very fine hair, however after i blow dry my hair it gets frizzy. I prefer to air dry it, but who has the time?! 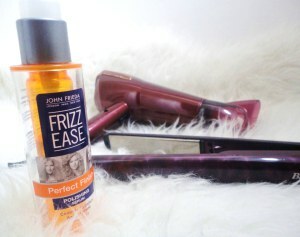 I use about 1 pump of the John Frieda Frizz Ease after I’ve blow dried my hair and straightened it. You can use more or less depending on your length and thickness. My hair isn’t that thick. The serum really just calms my hair down, controls the fly aways and gives it a little shine, but not too much. I don’t recommend applying it to the roots of your hair, because it can get very greasy.